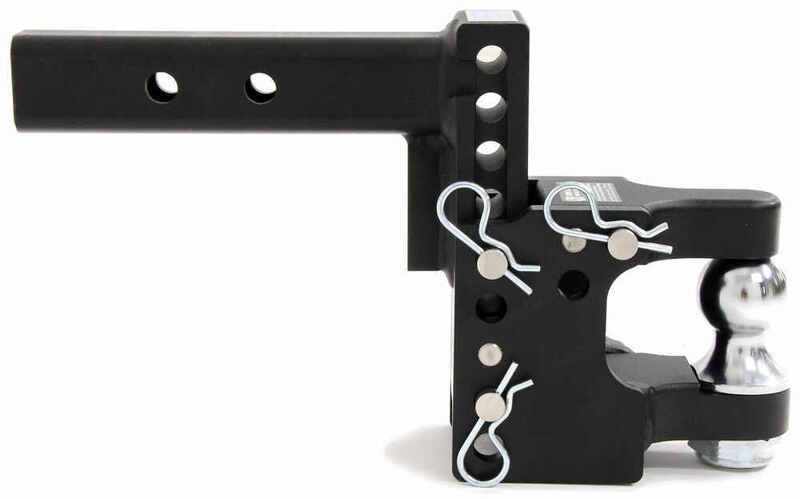 Flip and stow this pintle hook combo beneath your hitch for a sleek look when you are done towing. Haul up to 16,000 lbs with the pintle hook or up to 10,000 lbs with the 2" ball. 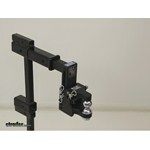 Call 800-298-8924 to order B and W ball mounts part number BWTS10055 or order online at etrailer.com. Free expert support on all B and W products. 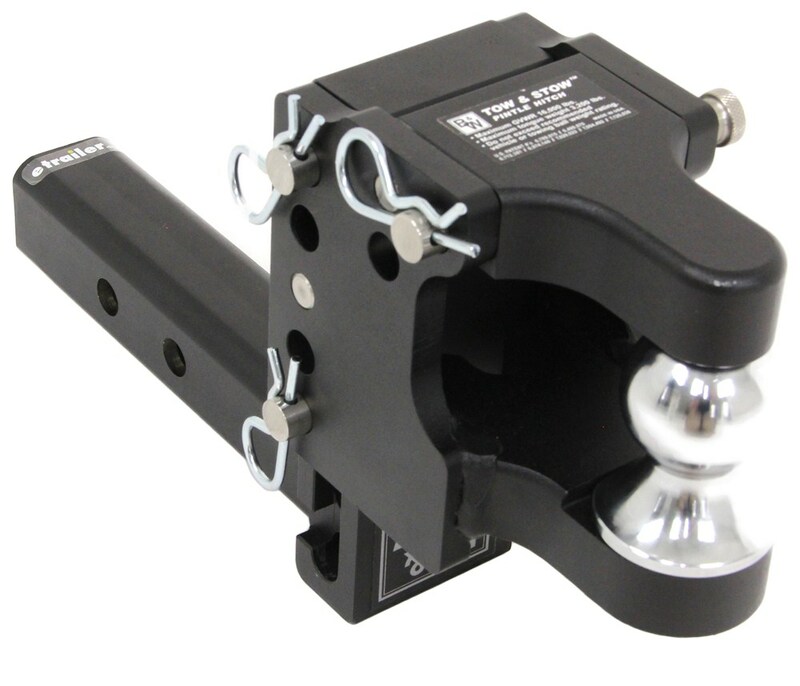 Guaranteed Lowest Price and Fastest Shipping for B&W Tow & Stow Pintle Hook with 2" Ball - 2" Hitches - 10,000 lbs/16,000 lbs. Ball Mounts reviews from real customers. Hitch pin hole farthest from ball: 6-3/4"
Hitch pin hole closest to ball: 4-3/4"
Hitch pin hole farthest from ball: 12-1/4"
Hitch pin hole closest to ball: 10-1/4"
Hitch pin hole farthest from ball: 3"
Hitch pin hole closest to ball: 5"
Today we'll be reviewing part number BWTS10055. This is the B and W Tow and Stow Pintle Hook with 2 inch ball for 2 inch by 2 inch trailer hitch receivers. The pintle hook is going to give us a gross towing wait capacity of 16,000 pounds, and then when just using the 2 inch ball, that capacity is going to reduce to 10,000 pounds. 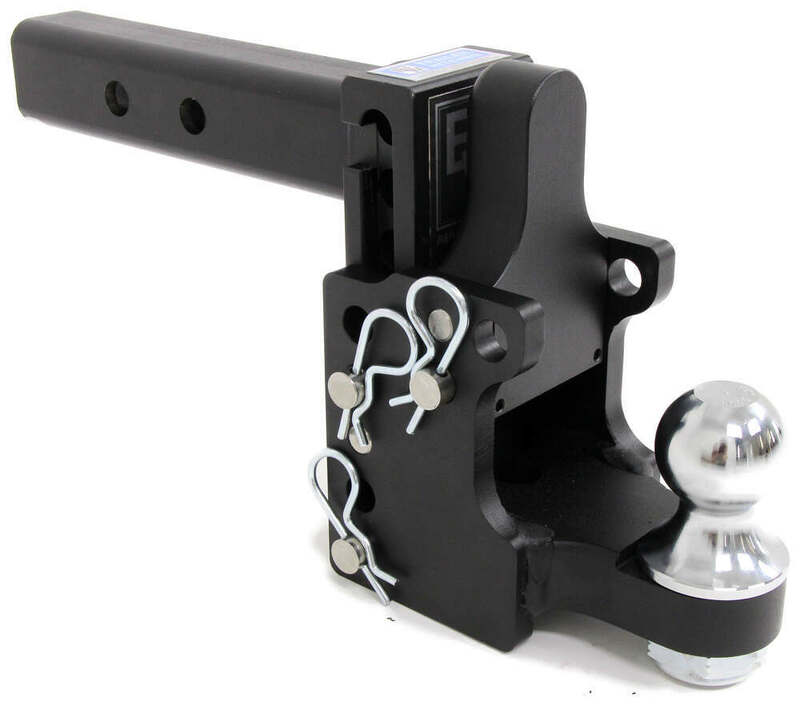 The pintle hitch and hitch ball combo is going to let you hook up your trailer to your tow vehicle. The shank simply slides into the receiver tube of our hitch. You can see here that you do have two different pinhole locations to choose from. You will want to make sure that you have enough clearance from the distance of the center of the pinhole to the back of the shank of either one. If we measure from the center of the pinhole that's closest to the rear of the shank to the rear of the shank, that's going to measure 3 inches. The other pinhole is going to measure 5 inches to the back of that shank. For our application today, we will be using the pinhole that's closest to the back of the shank. We'll line up the pinholes and insert our hitch pin and clip or hitch pin and lock. These items are sold separately. You can refer to the mounts products page under Related Items to view those or go to our website and type in part number PC3, and it will refer you to this 5/8 inch pin that comes with the clip that I'm using today. 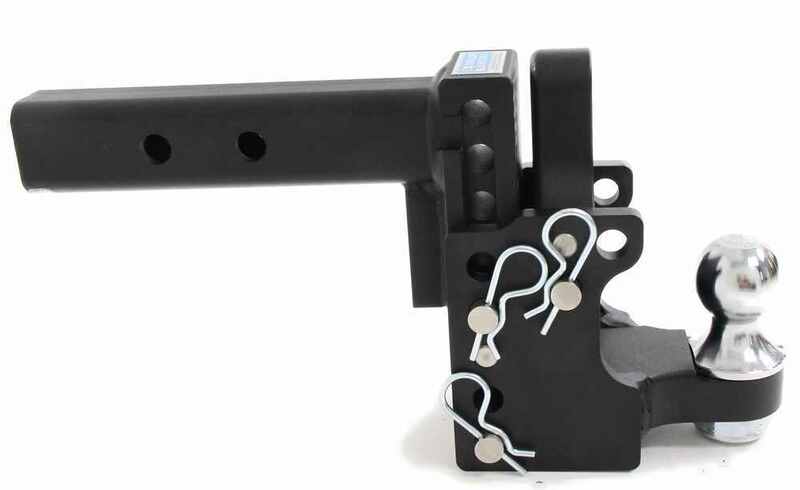 Your pintle hook connects to the net ring couplers, and your hitch ball is going to connect to standard ball couplers. The other great feature about this system is that it has a stowable design. It's going to let you store your pintle hook with the ball underneath your vehicle. All we need to do to gain access to that is remove the pins here at the back, and then we can actually rotate this or pivot it underneath our hitch. Then we can reinsert both of our pins, and we'd be able to reinsert our clips to fully secure that. This is going to give use that nice flush look that we're looking for at the back of our vehicle, and it's also going to increase our safety was we maneuver around the rear of our tow vehicle. To bring it back out, we'll just remove the pins, and then we can adjust this up and down the shank. It does adjust in increments of 1 inch, so we can pick whatever application is best going to suit our towing needs. We'll reinsert the pins and secure it with the clips on the other side. The adjustable height is going to let you tow trailers of different heights and still be able to use your same vehicle. This system has dual processed chrome plating here, on the hitch ball, that's going to provide excellent resistance against rust. Everything else has a nice black powder coat finish, which is also going to be corrosion resistant. The pins are nice and solid and they create good, sturdy, rustproof connection points. The entire unit has a nice durable steel construction with high yield tubing that's going to offer superior strength. 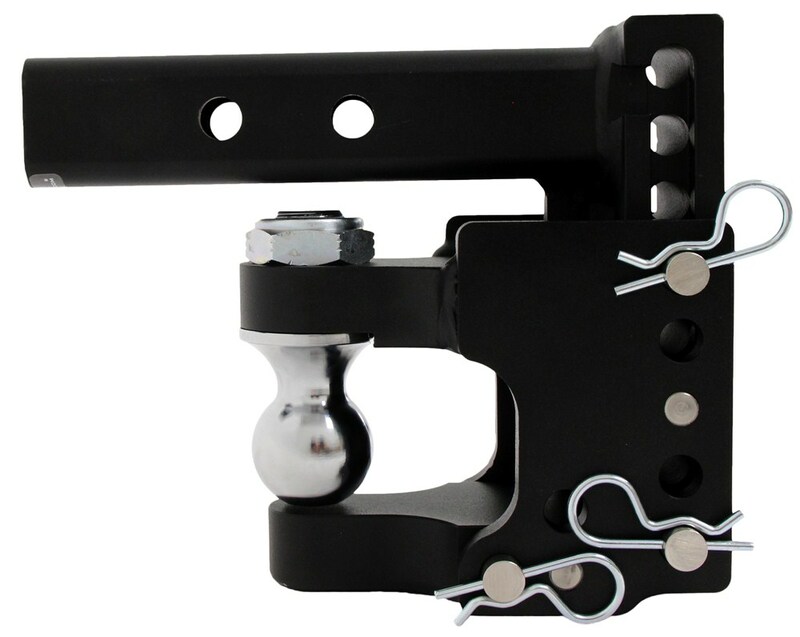 Once again, it is designed to work with 2 inch by 2 inch trailer hitch receivers. Right now it's in the pintle hook configuration. If you want to switch to be able just to use the hitch ball, then you remove the pin, flip up the pintle hook, and then reinsert the pin and secure it with the clip on the other side. Then you have full access to the hitch ball. Now, with this system at its lowest setting, it's going to provide us with a maximum drop, measuring from the inside top edge of the receiver tube to the top of our ball platform, of 8 inches. A couple of other measurements to go over before I switch it over to the rise position, is we're going to measure the distance from the center of the hitch pinhole to the center of the pinholes on the mounting block. Again, I am at that furthest back pinhole location. From center to center, it's going to measure 6 and 3/4 of an inch. If I scoot it to that other pinhole location, that measurement is going to decrease to 4 and 3/4 of an inch. Measuring from the center of the hitch pinhole to the center of the hitch ball from the outer most connection point is going to give us a measurement of 12 and 1/4 of an inch, and then from that other pinhole location, that measurement is going to measure 10 and 1/4 of an inch. You can use this system in the rise position. All we need to do is remove the two pins here on the back. Then we can raise the mount block up, rotate it, and slide it off. Then we can take our shank, flip it to a rise position. Then we'll just reinsert the pin so it's held in place and secure it with the clip on the other side. Now what we want to do is we want to take our mount, feed it through the bottom, rotate it, move it to its highest setting, and then reinsert our pins and secure it with the clips. Now that we have the mount rotated over to the rise position and set at its highest setting, if we take a measurement from the inside top edge of the receiver tube to the top of our ball platform, which would be here, so if the imaginary line comes over, it's going to give us a maximum rise of 6 and 1/2 inches. That's going to do it for today's review of part number BWTS10055. 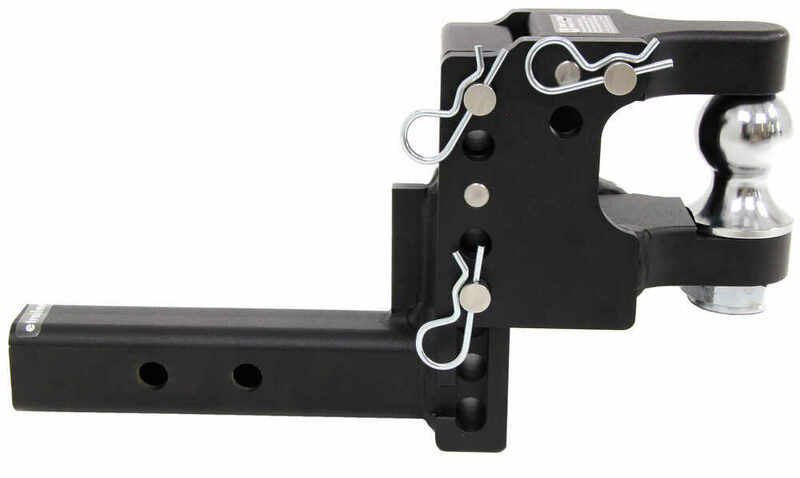 This is the B and W Tow and Stow Pintle Hook with a 2 inch ball rated at 10,000 pounds with the ball and 16,000 pounds using the pintle system. .
Order: RelevanceNewestRating - High to LowRating - Low to High Flip and stow this pintle hook combo beneath your hitch for a sleek look when you are done towing. Haul up to 16,000 lbs with the pintle hook or up to 10,000 lbs with the 2" ball. Awesome!!! From first look at this product I knew I wouldnt be disappointed,and Im not. Dont hesitate,this product is for life! 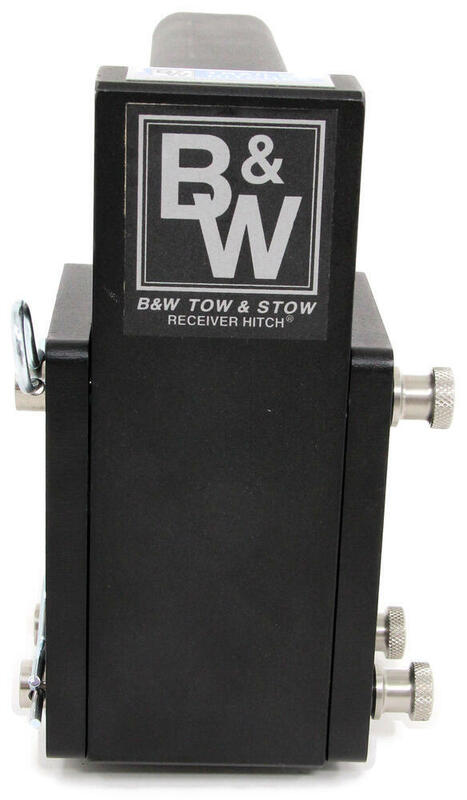 If you are using a hitch reducer sleeve such as Reese # 58102 in your Ram 2500's 2-1/2-inch hitch to allow it to work with 2-inch hitch accessories then yes you can use the B&W Tow & Stow Pintle Hook # BWTS10055 along with extra-long hitch lock # SHP2040-XL. The B&W has a hollow shank which is required to use this anti-rattle lock. The B and W Tow and Stow Pintle Hook part # BWTS10055 is now offered with stainless steel pins because of the recall on the nitrotec coated pins that you referenced. All of the stock we carry has the stainless steel pins so you would not need to worry. The nitrotec pins were black, and as you can see in the product pictures and in the review video I attached they are now silver. 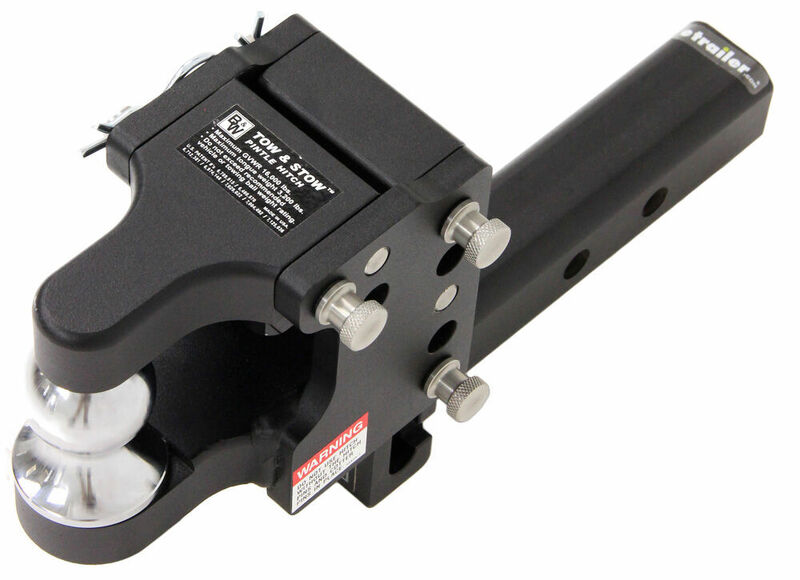 The adjustable ball mount you need is the B&W Tow & Stow Pintle Hook # BWTS10055. Based on the pictures you sent in you need a drop right at 7-1/2 inches and this can do a max drop of 8 inches which will work great, and since it's not considerable more drop than you'd need you won't have ground clearance issues. If you have a hitch ball with a smaller shank diameter than the size of the hole in your ball mount it is possible to use a bushing adapter # C21201 or one of the similar items shown on the linked page. These take up the extra space between the shank and the ball mount hole. 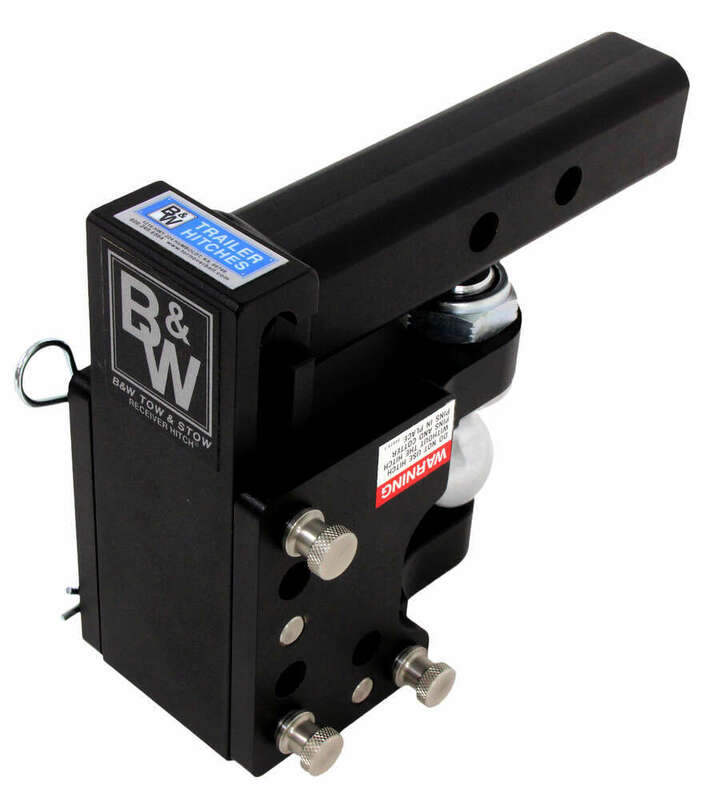 The B&W Tow & Stow Pintle Hook with 2" Ball # BWTS10055 that you referenced comes with all hardware needed except for the hitch pin and clip needed to secure it in a hitch tube. For a hitch lock and anti-rattle device we have the part # 63232 which would work well. Or for just a hitch pin part # PC3. 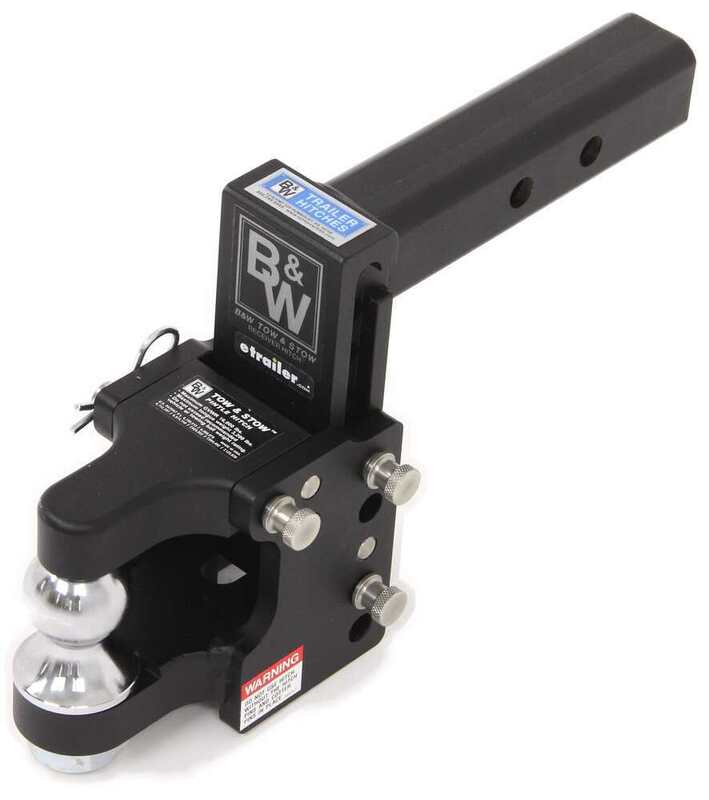 The B&W Tow & Stow Pintle Hook, part # BWTS10055 will work with a 2-inch trailer hitch receiver, and will work with the 2-inch coupler on your boat trailer. 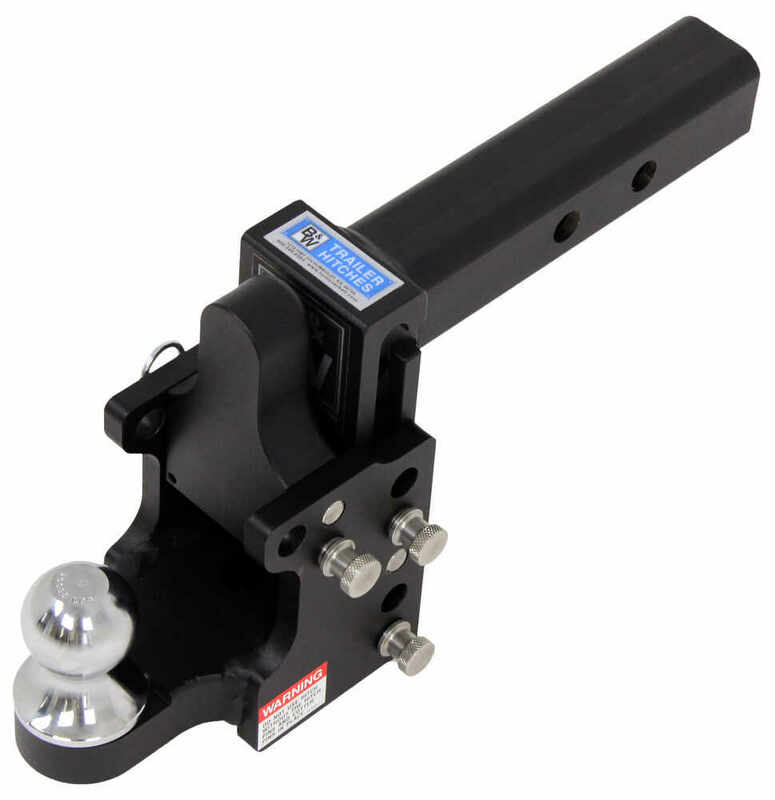 This Pintle hitch will also work with trailers that have a lunette coupler.